Have you heard about a relative's service in the "CCC" and wondered how to get more information? The National Archives & Records Administration is a good resource for finding Civilian Conservation Corps (CCC), Enrollee Records. The CCC personnel records consist of microfilmed "Individual Records" of enrollees and paper Official Personnel Folders (OPFs) of men who were formerly employed by the federal government (e.g. Camp Leaders, Medical Officers, etc.) These records are archival as they have been transferred by the originating agency to the legal custody of the National Archives and Records Administration (NARA). We have include a request form here for your convenience and you can also find one by following the link above to NARA. click link above to open and print form. NARA will do a free search for workers in any state. If a record is located, NARA will send you an invoice and once you submit the fee, NARA will send the complete record. After you receive CCC records, continue to Step 3. If man served in South Dakota, please bring to the CCC Museum or send copies to CCC Museum of South Dakota, Name and camp of CCC worker will be added to database. Papers will be archived for Civilian Conservation Corps Museum of South Dakota, Hill City, SD. If you have, or find information about the "CCC Boys" and/or the camps they worked in we would love to hear from you. If you have photos or documents that you would like to donate to the Civilian Conservation Corp Museum of South Dakota, please contact us. We can also make arrangements for scanning or photographing your items should you wish to keep the originals. 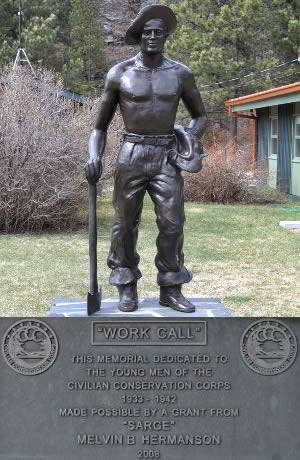 The Civilian Conservation Corps Museum of South Dakota is located at: 23935 Hwy 385, Hill City, SD 57745 in the Hill City, SD Visitor Information Center.